You'll appreciate this exceptionally reliable compressor that provides silent operation for multiple artists at one time. 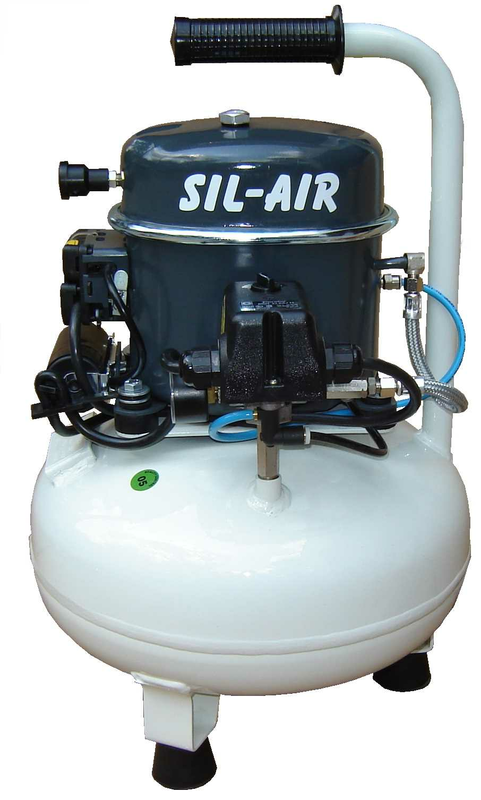 Silentaire Sil-Air 50-15 Ultra-Quiet Compressor. If you work calls for the use of a powerful compressor, but you want silent operation, you’ll find these features and more with the Silentair Sil-Air compressor. This handy and affordable unit has the many special features for which this hyper-silent series is known. This includes the built-in line pressure gauge and moisture trap, as well as a standard safety valve and filter for the air tank. However, the unique feature of this specific model is its heat-spreading cast iron motor. This way of managing the normal heat provides you with more efficient operations and productivity. For example, as many as three artists are able to use the compressor at the same time without any compromise in power. In fact, this compressor, with a ½ horsepower motor and a 4 gallon tank, is one of the most robust compressors available to use on your airbrushing projects. The extra-large tank, combined with the powerful and silent motor, allows the compressor to run with fewer shut offs, which means less heat is generated during operations. Of course, heat is the real enemy for reliable operations of compressors, and this added capability provides durable use over a longer useful life. The larger compressor represents a much better return on your investment, while providing dependable use on a daily basis. If you count on a compressor for your projects, whether airbrushing or other applications, you’ll find this unit an excellent choice that runs silently and without interruption. The built-in wheels and handle provide portability and added ease-of-use. Whether using this compressor in the shop or at remote locations, it will do the job for you day in and day out.